The Oblate Sisters of the Sacred Heart of Jesus currently serve in six countries on four continents. They are in the order of foundation: Italy, the United States, Brazil, India, Guinea Bissau, and Peru. 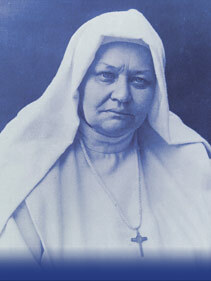 The Oblate Sisters were founded by Mother Teresa Casini in Grottaferrata, Italy on February 2, 1894. Today we serve throughout the country of Italy in eleven locations. For more information log on to: www.suoreoblate.it. 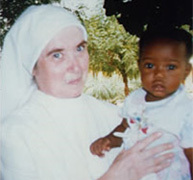 Oblate Sisters Clara D'Amico and Chiarina Antonucci first came to this country in 1946. Bishop James McFadden invited the Sisters to begin a foundation in his newly established diocese. 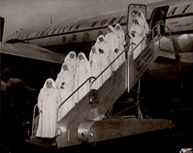 By 1949 ten more Sisters arrived from Italy and formally began the USA foundation. Today we serve in the Diocese of Youngstown in Ohio. For more information see the USA foundation. Over forty-eight years ago Pope Paul VI requested that all religious congregations send some of their members into mission territories throughout the world in order to participate in the Church's mandate to introduce the Good News of Jesus to God's people. Thus in 1966 five Oblate Sisters were sent to the poor in Brazil. Today the Oblate Sisters serve in four locations. For more information see Brazil, South America. The Oblate Sisters of the Sacred Heart of Jesus see the need to assist priests in their ministry in whatever country they may serve. In 1992 the Oblate Sisters responded to the invitation by a diocesan Bishop to assist priests in his diocese. Today the Oblate Sisters serve in five locations in the State of Kerala, India. For more information please see India. Simultaneous with the establishment of the Indian foundation, a missionary Bishop in West Africa in the Country of Guinea Bissau invited the Oblate Sisters to establish a foundation in his diocese. 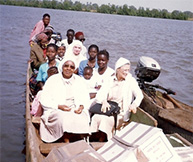 Thus in 1992 the Oblate Sisters generously began a foundation on the African Continent. For more information see Guinea Bissau, Africa. Knowing the Oblate Sisters' charism that seeks to promote all vocations especially those to the ordained priesthood, Bishop Santarsiero Rosa invited the Oblate Sisters to begin a foundation in the Diocese of Huacho. With the assistance of the Oblate Sisters, the Bishop wanted to encourage the youth of his diocese to listen to God's call in their life. For more information see Peru.